I can’t believe it! The holidays have come and gone and it’s already January! 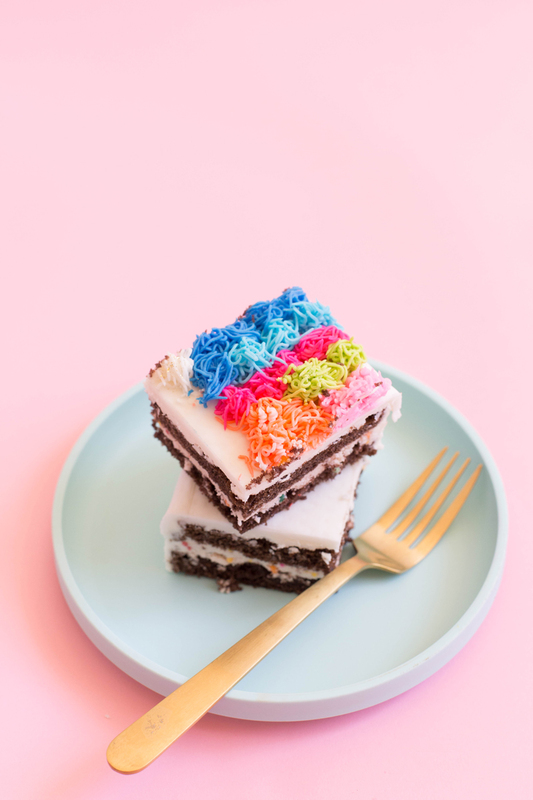 In case your feeling a little blue about heading back to life/school/work this week, this cake is sure to brighten up your day! 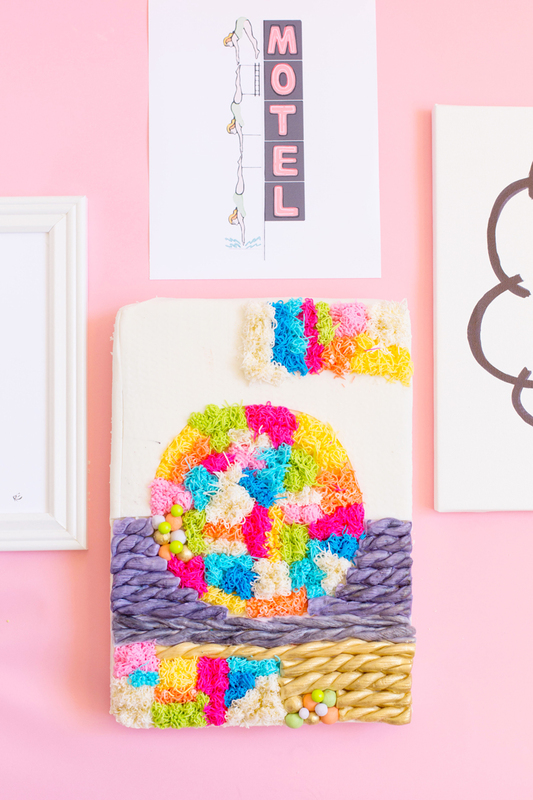 Last year, I’ve fell totally in love with all the gorgeous woven wall art everyone is making. These gems blow my mind and I just can’t get enough of all the different colors and patterns you can make with a little tapestry texture. But of course, I have to put my own spin on this trend and make it a sweet treat we can all enjoy! 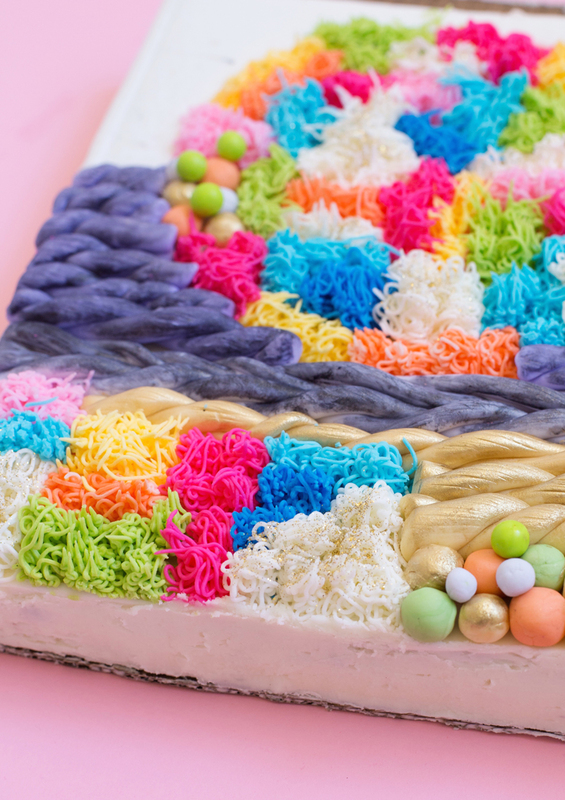 You’ll have so much fun making this woven tapestry cake, it just might be too pretty to eat. 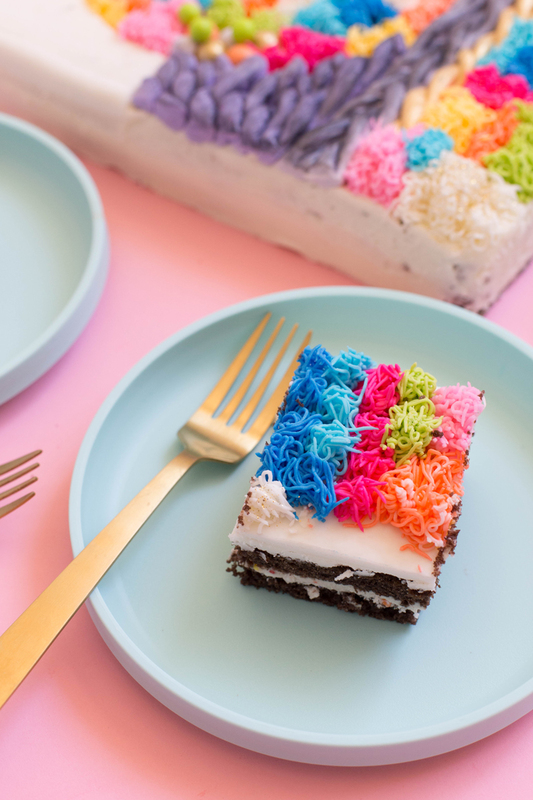 The cake is a show stopper for any birthday party and an instant fix to those dreary winter blues. And your cake stands are too damn pretty to be sitting in the cabinet all winter long! 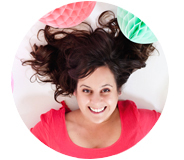 *I recommend getting a few of these piping tips to use for several colors. For the cake, I used a basic chocolate cake recipe and a funfetti buttercream, because we always want to be a little festive. I’ve included the recipes below, but you can use any flavor cake and buttercream combo you want. 1. Preheat the oven to 350 degrees and prepare your cake pan with parchment paper and a little butter. 3. Pour batter into your prepared cake pan and bake at 350 degrees for 35 – 40 minutes until a toothpick comes out clean. Let cake cool completely before assembling. 4. In the bowl of a stand mixer (or handheld) with the paddle attachment, cream butter on medium speed until it’s light and fluffy. Slowly begin to add your powdered sugar. Once all of the powdered sugar has been added, add vanilla. 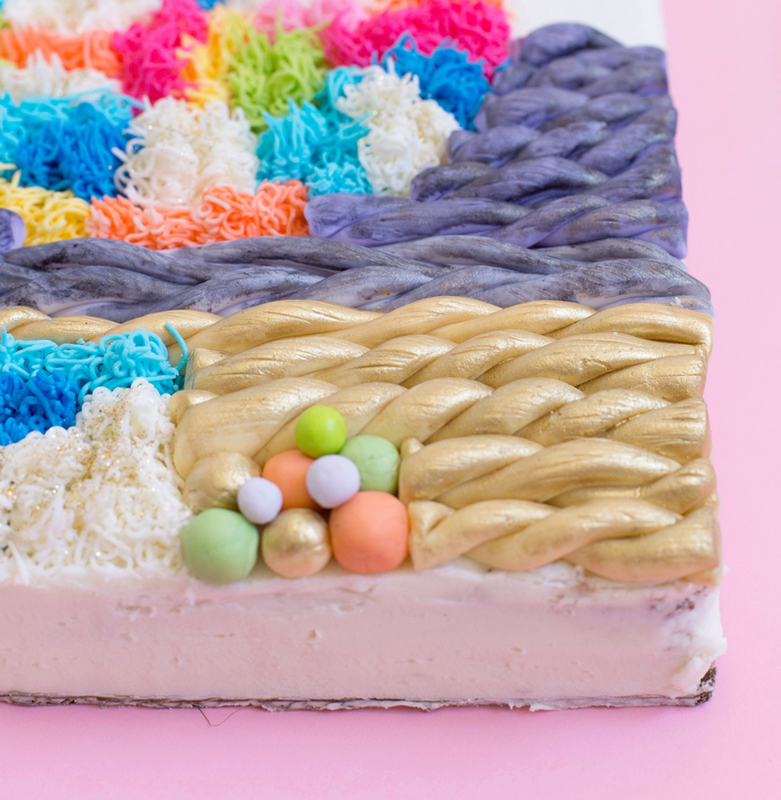 Set aside half of your buttercream for decorating. With the remaining half, gently fold in your jimmies for the filling. 5. To assemble your cake, carefully split your cake into two layers and fill with buttercream. Lightly frost your entire cake. I recommend choosing 3-4 elements you’d like to create. I chose a fun and easy fondant braid, basket weave fondant, buttercream yarn, and fondant “felt” balls. 5. To make the fondant braids, roll fondant into 2-3 small ropes and braid together. Cut to size and place onto your cake. I used white fondant and painted with gel food colors. You can do this or color your fondant beforehand. I thought painting made the braid look more realistic. 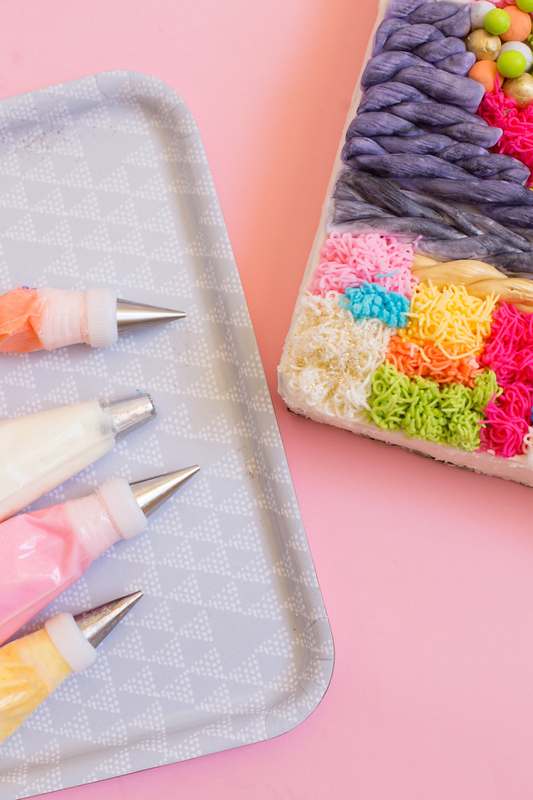 With a small knife add texture to your fondant braid by lightly scratching the surface of your braid. 6. The basket weave is really simple. 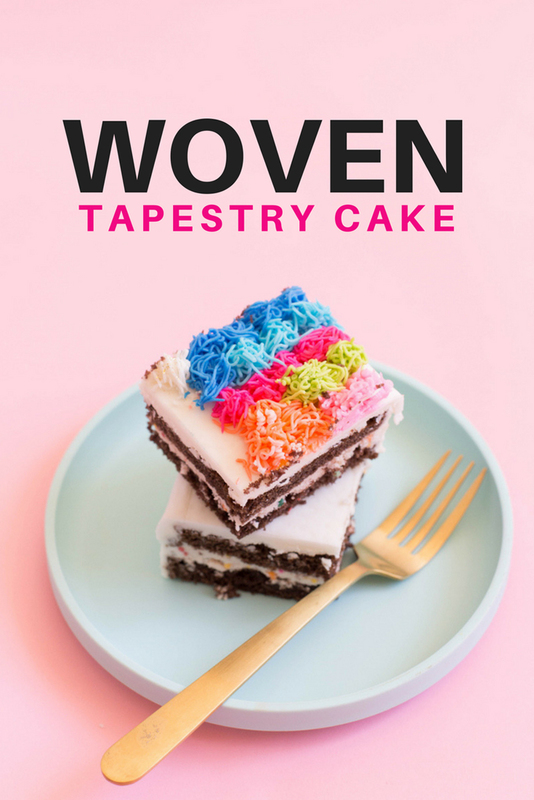 Decide how much of your cake you want to use the basket weave pattern on. Roll your fondant out to ¼” thick, then place your basketweave embosser on top of your fondant and roll over with your rolling pin to create the pattern. Cut your fondant piece to size and lay on top of your cake. Again, you can color your fondant any color you want. 7. For the fondant “felt” balls, these are super easy, color your fondant and roll into small ½” balls and place on your cake. 8. The buttercream yarn was my favorite part. I think it’s the part you can be the most creative with. Separate and color your buttercream into desired colors and fill your pastry bags fitted with the #233 decorating tips with buttercream. I used a circle template to “draw” a circle shape into the buttercream to use as a template. Begin to randomly fill space with each color to make the “yarn piles”. I love how this cake turned out so much! 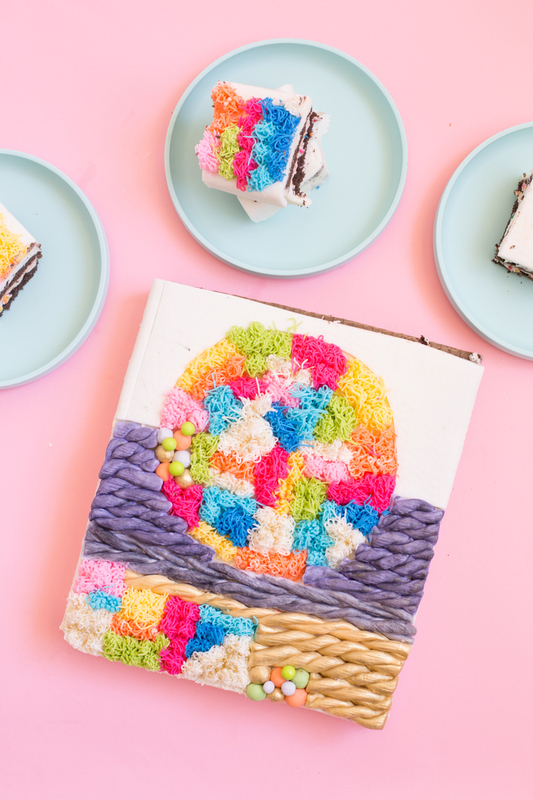 It is definitely one of the cakes you can be super creative with. The most difficult part was just choosing the colors I wanted to use, there’s just so many options. Enjoy!